By Tom Kertscher on Thursday, September 27th, 2018 at 3:48 p.m.
As the second term of Gov. Scott Walker winds down, we’re issuing final ratings on the Walk-O-Meter, our tool for tracking his campaign promises. Walker’s second term ends in January 2019, although the Republican governor is seeking a third term in the Nov. 6, 2018 election. His challenger is Democrat Tony Evers, the state schools superintendent. 1. Return budget surpluses to taxpayers — a promise similar to ones on cutting taxes. 2. Sell unneeded state assets for state debt reduction — a pledge aimed at paying down debts. 3. Serve a full term — something that came into question when he briefly ran for president. Walker said during the 2014 campaign: "Every year we have a surplus, which we’ve had the last couple years, we’re going to continue to put that right back into the hands of the people who earned it, the hard-working taxpayers of this state." When we most recently rated this promise, in 2016, our rating was In the Works. In the 2013-'15 state budget, Walker and the Republican-majority Legislature suspended a state law requiring the state to put half its surplus into the state's rainy-day fund. That allowed them to provide additional tax cuts. But there was no such surplus with the 2015-'17 state budget -- thus, nothing to return to taxpayers. The state budget for 2017-’19 budget, which runs through June 30, 2019, should run a $385 million surplus, according to a January 2018 estimate by nonpartisan Legislative Fiscal Bureau. So, we won’t know until sometime after that date whether a surplus is actually realized, but the estimate is considered solid. In response, Walker and the Republican-led Legislature adopted in April 2018 a tax bill that included a one-time $100 per child tax rebate to parents and a one-time weekend sales tax holiday for all consumers. Walker’s move was criticized as taking some $172 million away from what could have been spent on education and infrastructure. Noting that the $385 million is about eight days’ worth of state spending, Jon Peacock, director of the nonprofit Wisconsin Budget Project, questioned whether it's wise to return the money rather than saving it for when revenue slows. Historically, he told us, the governor and the Legislature "often find themselves in the position of having to make very difficult tax and spending choices as they tackle the next biennial budget." In sum, Walker returned to taxpayers funds from one budget surplus and has returned money from what is an expected surplus. We rate this Promise Kept. When we first examined this promise, in September 2017, our rating was Stalled. The pledge really hadn’t gotten off the ground. As we noted then, a state law adopted in 2013 was aimed at using state property sales to reduce state debt, but according to a June 2016 Milwaukee Journal Sentinel news article, it had largely gone unused. The measure, part of the 2013-'15 state budget, gave Walker broad authority through the state Building Commission to sell property -- including prisons, highways, heating plants and university dormitories -- to pay off state loans. The debt amounted to $8 billion at the time. The law had only been used in one deal, and that had been in the works before Walker took office. Two properties were sold for a total of $13 million in that deal. But most of the money was pegged for paying off debts on those properties, not for retiring previous state debts. Given that, we rate this Walker pledge as Promise Broken. Less than a month before election day in 2014, Walker stated during a debate with Democratic challenger Mary Burke: "My plan is if the people of the state of Wisconsin elect me on Nov. 4 is to be here for four years…It's a position I'm committed to." But in July 2015, eight months after defeating Burke, Walker’s pledge was called into question when he announced his run for the 2016 GOP nomination for president. 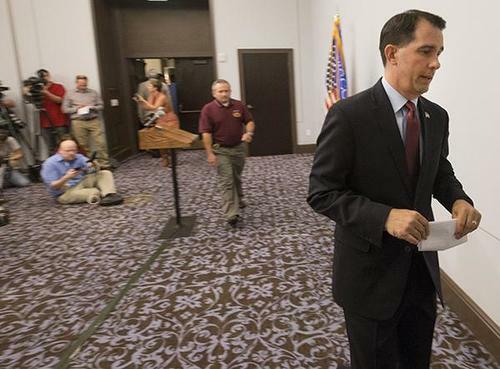 At that point, we rated Walker’s pledge Stalled. Two months later, however, Walker withdrew from the presidential race (and we revised our rating to In the Works). After Donald Trump won the election, Walker insisted he would not consider taking a position in Trump’s Cabinet. And indeed he has not only remained in office, he opted to seek a third term. At the same time, implicit in Walker’s promise was that he wouldn’t try to leave. He ended up staying, but he did try to leave. So, on his pledge to serve a full second term, we give Walker a Compromise.